If Budweiser and Coors are the only drafts you can name-drop when someone asks what your favorite beer is, it might be time to expand your libation horizons (and your palate). Tickle your taste buds by sampling craft beer from the many brewers all over the country who use traditional ingredients and beer-making practices to produce fantastic-tasting beers. 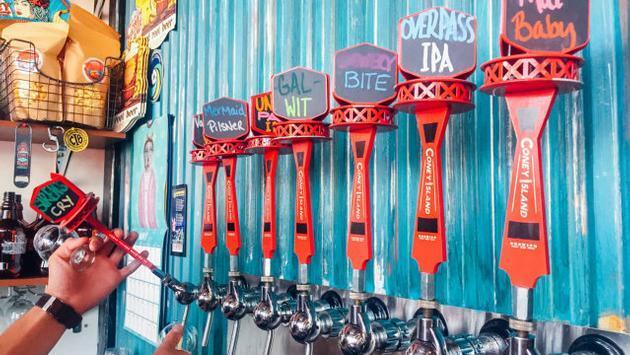 From Los Angeles to Coney Island, here are a few fantastic craft brewing companies you must pop into for a pint of the cold one should you find yourself in town. And no, we’re not talking about Blue Moon. Located in the city’s vibrant Arts District, this Los Angeles brewery was only founded in 1997. However, it’s already fast becoming an LA institution, distributing to many of the region's bars, pubs and restaurants. Angel City bottles and cans several IPAs, lagers and porters—most of which are available on tap—plus a few limited editions available on rotation and seasonally. Since opening its doors in 1994, the award-winning Beaver Street Brewery—Flagstaff’s first brewpub—has expanded to found sister company Lumberyard Brewery. But its mission to handcraft exceptional ales and lagers remains. Order a beer flight with great, hearty dishes at their massive, steampunk-themed pub located just a block from the Flagstaff train station. Cleveland may finally be getting the Renaissance it’s been waiting for, but when Great Lakes Brewing was founded, much of the Ohio City neighborhood was dilapidated. Still, it stayed and persisted, naming many of its brews after all things Cleveland. These days, the brewpub is right in the thick of the now hip neighborhood’s gentrification, and it’s become the most important craft beer brewer in the city. At 7 years old, Beaver Street’s sister company is still kind of a newbie in the craft beer game. Still, by taking cues from its older sister, microbrew Lumberyard Brewing Company is now established in one of Flagstaff’s most historic buildings, has already garnered awards and is also now producing almost 7,000 barrels a year. It has seven beers on tap at the brewpub, which is also incidentally famous for its delicious banana pudding. Route 66 ran along the street where Mother Road Brewery stands today, lending its famous nickname to the microbrewery. It’s becoming more of a production brewery, with its three mainline beers’ distribution—cans only, they’re more recyclable than glass—getting priority over its small batch of craft beers. Still, its brewpub will be on hand in Flagstaff, especially for those who are blazing their own Route 66 trail. Taste the Northwest in beer form in the Cascade Mountains. Microbrew Roslyn Brewing Company might be tucked away in the middle of nowhere—a small town whose biggest pop culture claim to fame is that it was the filming location for 90s show Northern Exposure—but its small variety of deliciously crafted, German-style lagers are worth the drive. The craft brewery has won many awards for its lagers and ales and has been doing it the longest in the state of Wyoming. A stop at its brewpub in the charming town of Jackson is an essential experience.